I'm so excited to announce that the Shop & Swap event that I put together last year is returning to NYC on Thursday, June 13th 6-9PM. This event has evolved into all shop (sorry NO swapping) however, you get to shop the closets of some pretty incredible notables in the plus size fashion world. This curvy and plus size event is open to the public and for the most part, we are selling clothing (sizes 10-26), accessories, jewelry and shoes! There are both LUXE and LESS items up for grabs. Whose closets might you be shopping you ask? That would be mine of course (you know what I do...I hope), model/blogger Allie McGevna, Madeline Figueroa Jones (Editor in Chief of Plus Model Magazine), Nicolette Mason (blogger/Marie Claire contributor), Claire Sulmers (Creator of FashionBombDaily) and Nadia Aboulhosn (model/designer/blogger). Go ahead! Get excited!! What are we selling? Everything from rare vintage finds (in all sizes) and ASOS Curve to Fendi peep toes and Diane Von Furstenberg separates. Remember - I told you, LUXE and LESS! 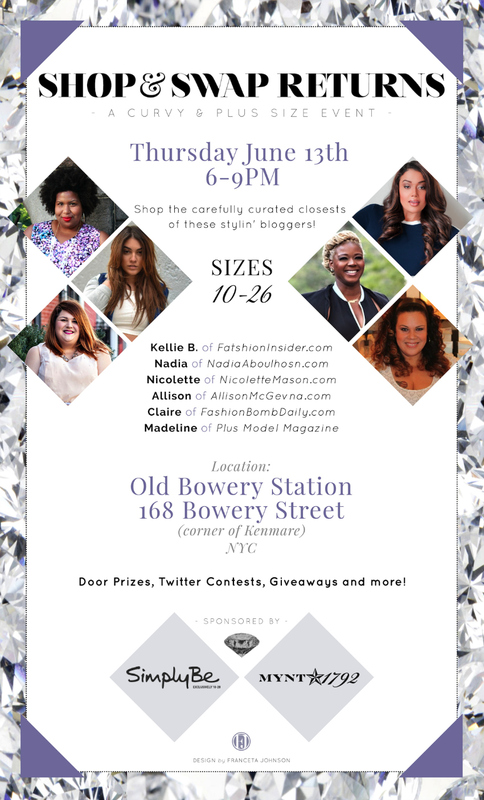 I also encourage women of all sizes to attend because there will be amazing accessories including vintage, Rebeca Minkoff, Marc by Marc Jacobs, Gucci and maybe even Chanel - if Nicolette can part with her pumps! Let's not forget the giveaways...loads of hair and makeup products, $100 gift cards from Lane Bryant, dresses from Rachel Pally (more to be announced soon! ), amazing Twitter contest from our sponsors MYNT 1792 and Simply Be. Have questions? Leave a comment! Special thanks to my darling love Franceta for lending her other worldly talents to the invitation.